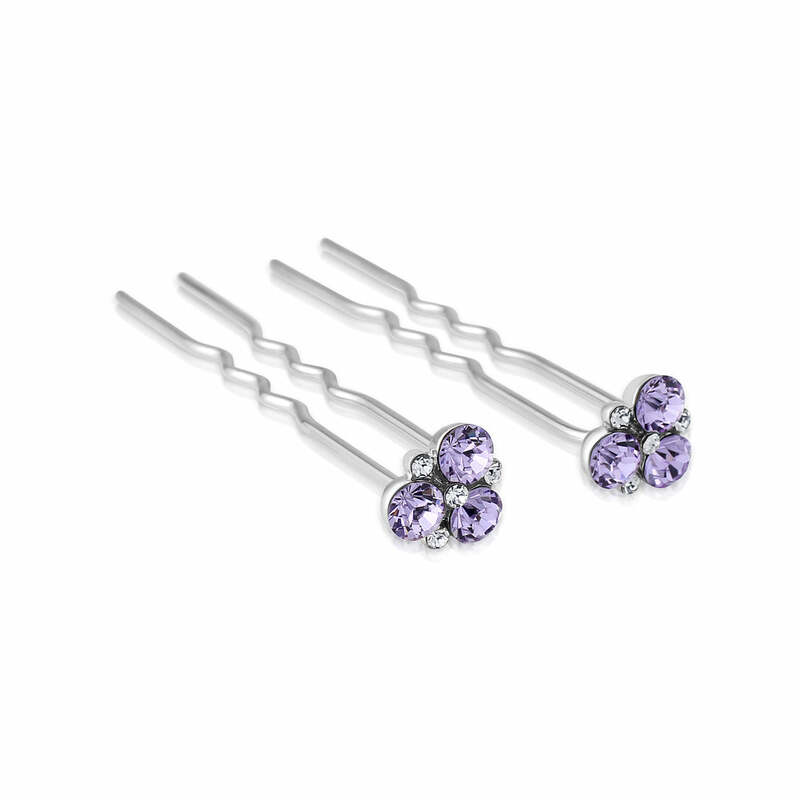 Fresh, pretty and mesmerising these lavender sparkling hair pins have a touch of retro charm. The divine hue of mauve adorning our Allure of Lavender Hair Pins is simply entrancing. Fresh, pretty and mesmerizing, three delicately shimmering lavender crystals are accentuated with petite sparkling clear crystals. Set on a double silver tone prong pin, this pretty pair looks beautiful on every hair colour from the lightest blonde, deepest auburn to the darkest ebony. Whether you choose to bejewel your updo with a single pair of these chic light purple hair pins or scatter several pairs throughout your locks, Allure of Lavender will add a touch of retro charm with their 1950s inspiration. From dressing a chic French pleat or stylish chignon, these pretties will secure your updo with a feminine burst of colour. If you are looking for the perfect lavender hair pins for your bridesmaids, these dainty hair accessories will exquisitely enhance your lavender wedding theme. With a coordinating jewellery collection in this captivating shade, team with our matching earrings and pendant as a bridesmaid gift your girls will treasure for years to come.